I’ve recently started watching Hell’s Kitchen. I know, I know, I’m a bit slow on jumping on the bandwagon, but I’m not one to watch tv. Scratch that. I watch a lot of tv. Some (my parents) would say too much tv, but I’m not one to channel surf, and though we got a new tv that I was so hyped about, I rarely watch anything on it. My tv is my macbook's internet. This can be good, because you don’t waste hours of your life watching commercials and channel surfing, but the consequence is that you won’t be exposed to such awesome shows as Hell’s Kitchen. Watching hell’s kitchen makes me all excited and giddy. It makes me want to head into my kitchen and cook up a storm. Take out a nice sharp and shiny Chef’s knife that’s worth a few pretty $$ and go to town chopping parsley, mincing onions, slicing chicken and sautéing god knows what else. This is amazing. I want to cook? I’ve always been a more of a baking sort of girl. If I bake it’s a hobby, a passion; if I cook it’s a chore. Hopefully this will change in the near future? I know my parents would sure like that! They are always telling me how I should cut back on baking and do more healthy cooking. Speaking of healthy cooking, I made this a week ago. My parents were glaring at me for baking just a taddd too much(I may or may not have baked every day for a week…hey! Whats a girl to do during summer vacation?! ), so I decided to make something more ‘healthy’ to balance it off. 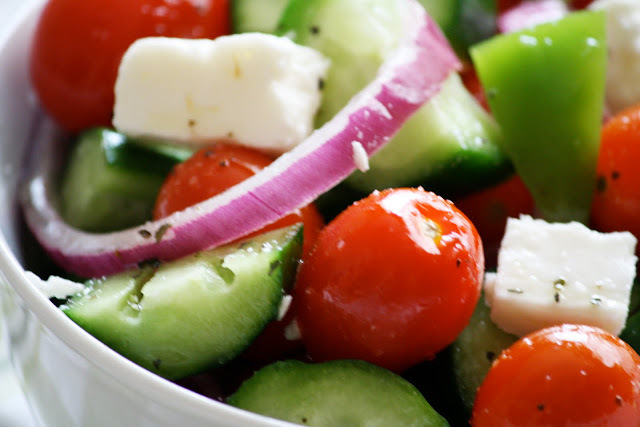 This Greek salad was amazing and I will definitely be making it again this summer! 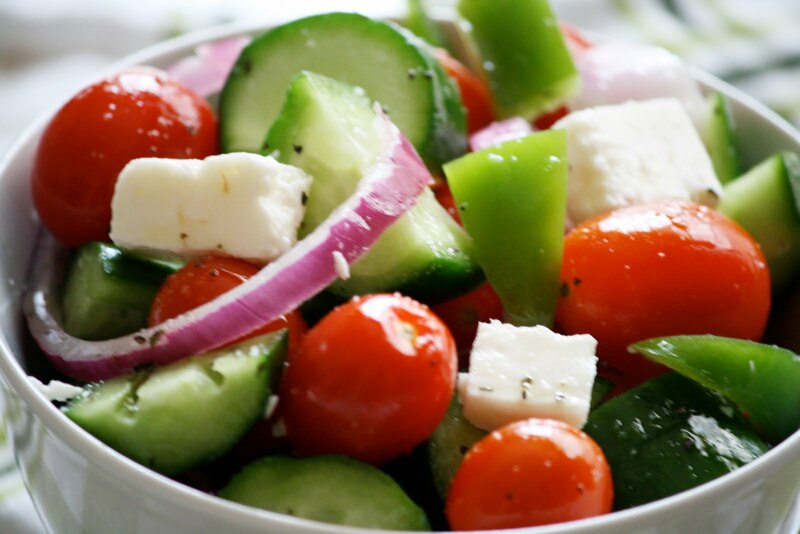 Its so light and delicious and easy to put together, it will probably become your staple salad recipe for the summer too! 1. This is all about taste, so add the veggies and cheese to your liking and toss with the sauce. 2. To make Sauce: combine 1/4 cup of lemon juice, 1/4 cup olive oil, 1 TBSP of Mustard, and 1/2 tsp of garlic powder and basil. Add a dash of pepper. I love all of these flavors together...so simple but so good! 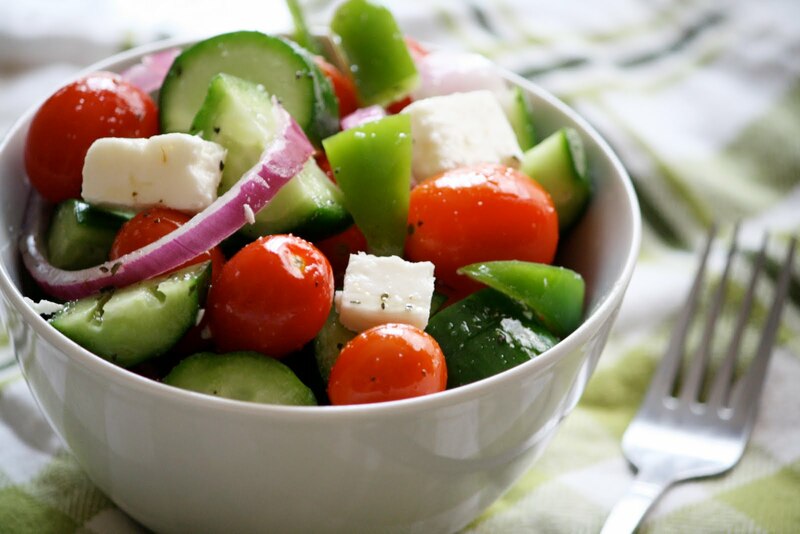 Delicious and so colorful! I would love to feature your recipe and site on mine, www.canigettherecipe.com if you are keen. Full credits and links back to you. Please let me know ASAP!